Les hit his peak in his senior year, gaining 924 yards on 163 carries for 5.7 yards per carry. He scored 12 touchdowns in 1944, and completed 14 of 32 passes for 344 yards. 6 of the 14 pass completions were for touchdowns. He set a new Big Ten Rushing Record and played in all of his team's nine games. One of the more versatile backs seen on any football team, he kicked, passed, blocked, tackled and carried OSU through a perfect season, all of which won him the title of the "Playing Coach." Horvath was no slouch in the classroom either, graduating in June 1945 with a degree in dentistry. Les entered the Navy in June 1945 as a double threat: dental officer in the morning and assistant football coach (to Paul Brown) in the afternoon. He continued coaching when transferred to Hawaii and won the service championship. After a three-year fling with the pros (Rams and Browns) Dr. Horvath established his practice in Los Angeles. His hobby was golf and he coached (very successfully) Bantam Football 1970-72, winning the League Title for Glendale. Les passed away in November of 1995. Les was elected to the National Football Foundation and College Hall of Fame in 1969. This was an extremely close vote and Horvath won the Heisman despite finishing first in only one section. Army's two standout sophomores, Glenn Davis and Doc Blanchard, who would later go on to win Heismans of their own, just about divided their points as Davis, who was from California and played at West Point, won in the West and the East and Blanchard, who was from Texas, won in the Southwest. Horvath had a huge amount of second and third place votes that pushed him above Davis and Blanchard. 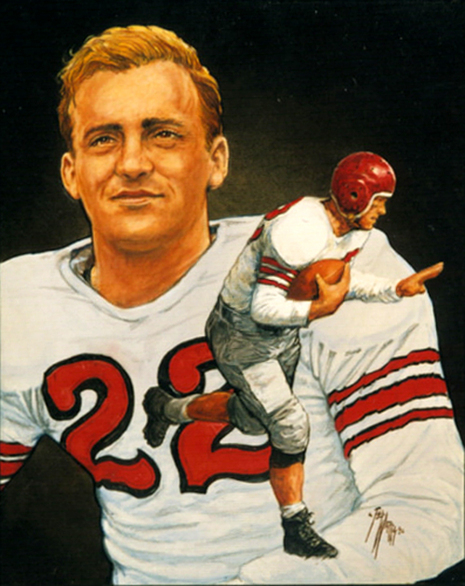 Leslie "Les" Horvath (October 12, 1921 – November 14, 1995) was the 1944 Heisman Trophy winner, who played quarterback and halfback for the Ohio State University. 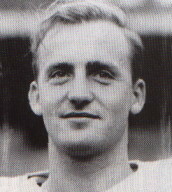 Horvath played for the Buckeyes in 1940, 1941, 1942 and 1944. He had already graduated with a bachelor's degree after the 1942 season, and moved on to graduate school. While studying dentistry in graduate school, head coach Carroll Widdoes asked Horvath to come back to the team for the 1944 season because of the manpower shortage caused by World War II. The college football rules at the time permitted the fourth year of eligibility beyond graduation because of wartime. Horvath didn't give up easily. He tracked her down later that day and finally charmed her into going out with him. During their conversation, Horvath mentioned he had played football at Ohio State and won the Heisman Trophy in 1944. She had no clue what he was talking about. She knew nothing about football, let alone what the Heisman Trophy was. As the conversation went on, Horvath and his buddies were having no luck convincing her he was a pretty popular guy. Though Ruby didn't believe him, she still thought he was quite charming and they started dating. "I never really knew much about football and I had no idea who he was when I met him," Ruby Horvath said. "He and his friends were trying to convince me he was somebody special and I didn't believe them. Then one year I went with him to the Downtown Athletic Club (in New York) and they called his name when they were naming past recipients of the award. He then looked at me with this look if as to say, 'See, I told you so'." Told you so, indeed. Horvath was the first Buckeye in school history to win the coveted Heisman Trophy and will have his No. 22 retired during halftime of the game tonight. Horvath is only the fourth Buckeye in OSU football history to have his number retired. Not bad for someone who didn't even play the previous year. "I started crying when I found out he was going to have his number retired. I was so happy," she said. "I just wish he could be here because this was the one thing he always wanted. He would be so thrilled to know that he's being honored this way. He loved Ohio State very much. It's such an honor to represent him. I'm going to be very excited and emotional during the ceremony." 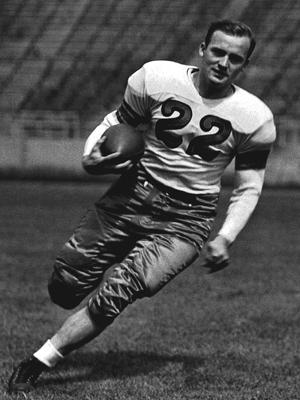 During his remarkable Heisman season in 1944, Horvath led the Buckeyes to a perfect 9-0 record and the Big Ten championship. He also helped the Buckeyes capture their first national championship in 1942. "The only bad thing about Les is that he wasn't very big," Graf said. "But he was very quick and aggressive and was the key to our whole season. Les used his brains to make up for his lack of size." Gene Fekete, who played fullback during Horvath's time, knew he was playing with a special breed of football player. They shared a unique bond no one else on the field could relate to. "He was a feisty runner," Fekete said. "He had a lot of speed and was very smart. He was only about 170 pounds, so when defenders got a hold of him he got a pretty good lick. "Les and I both had something special in common. We both spoke fluent Hungarian. So whenever we were talking on the field and didn't want anyone else to know, we spoke Hungarian. It used to drive our coaches and teammates nuts. Sometimes we would even yell at the refs in Hungarian." The Big Ten's Most Valuable Player in 1944, Horvath possibly was the most versatile player in the country during his time. He kicked, blocked, tackled, passed and ran OSU through its unblemished season and helped the team to a final No. 2 national ranking. He compiled over 1,200 all-purpose yards while leading the Big Ten in rushing (669 yards) and total offense (953 yards). By directing his team on the field, Horvath earned himself the nickname the "Playing Coach." "I remember in 1944 when we were playing Michigan and Les was calling his own plays," Graf said. "We were getting ready to score in the fourth quarter and Les kept giving the ball to our halfbacks. That wasn't working, so he just kept the ball himself on the next play, broke a couple of tackles and scored the winning touchdown. That was probably the biggest win of the season." The 1942 national championship season was supposed to be Horvath's last with the Buckeyes. He had entered dental school at OSU in 1943 and never expected to play again. However, because of the war in 1944, player shortages were abundant and the NCAA passed a rule allowing freshmen, as well as players who had previously been ineligible as freshmen, to play. Horvath fell into the latter category and was granted an extra year of eligibility. At the time, the decision was truly a blessing in disguise as no one foreshadowed him winning the Heisman. To this day, he is the only Heisman Trophy winner who did not play the previous season. "At first I wasn't sure I wanted to play," Horvath said during one of his last visits to Columbus. "Dental school was quite taxing. But coach (Carroll) Widdoes (national coach of the year in 1944) said I wouldn't have to practice all the time and agreed to fly me to the games, both of which gave me more time to study." Bill Willis, who played offensive and defensive tackle for the Buckeyes from 1942-45, said there was no one else like Horvath. "He had an outstanding personality," Willis said. "To me, he was an All-American both on and off the field. He was the best player of our day. He could never bull you over so he had to dance around you. There weren't many people who were able to catch him." "There are two people responsible for the boost in national recognition we (OSU) received during that time: Les Horvath and Paul Brown. Before those two individuals, Ohio State was not recognized nationally the way it is today. Those two were the reason Ohio State won its first national title in 1942. It is appropriate that Les is being honored and remembered in this way." "Not very many people know that he loved coaching kids (football) also," Ruby Horvath said. "That is one thing he loved to do. He took a lot of pride in coaching and was an inspiration to those young kids." Les Horvath wasn't even supposed to be playing in 1944. 1942 was his last season, and he had moved on with his life, never expecting to play again. But in 1944, because of player shortages due to the war, the NCAA passed a rule that allowed freshmen to be eligible as well as players who had previously been ineligible as freshmen. Horvath fell into this category, and he was granted one more year of eligibility. Needless to say, he made the most of it. Les did it all for OSU in 1944, playing halfback, quarterback and defensive back for a team that went 9-0 and finished #2 in the nation. Les was the 24 year-old leader of the Buckeyes, and he rushed for 924 yards, passed for 344 yards, scored 72 points, and played a total of 402 out of 540 possible minutes.